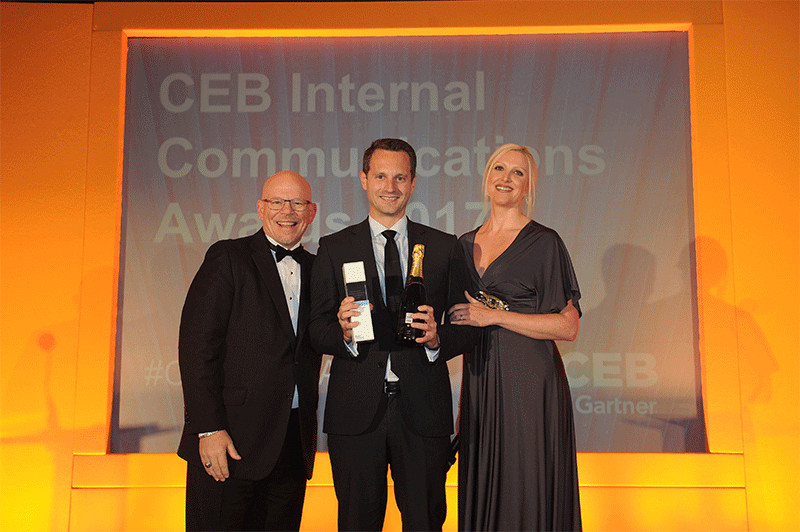 What a great awards night last week at the CEB Internal Communications Awards! The CEB Team did a great job to make the awards night very special. The room was full of nominated organizations and everyone was eager to hear his or her name. I sat right next to two icons of the Internal Communications community sharing great stories of how they engage their workforce. I was honored to be there because HealthSouth had submitted their employee app called Hive, powered by Sitrion ONE, to win the CEB Internal Communications Award in Innovation in Digital, Social, and Mobile Communications. On the shortlist, I read a line up of great projects from ING, Infor, E.ON, General Electric, Southwest Airlines, and many more. Two years ago, Lindsay Jones and Alyssa Hagan with HealthSouth faced an interesting challenge: How to connect a ‘disconnected’ workforce of tens of thousands of employees on hospital floors and between hospitals. They believed from the beginning that a mobile-first employee app was the only way to reach and engage all their employees. No Intranet could do what an app could do on every employee’s smartphone. All their research and internal surveys showed that employees wanted an app over a Kiosk or PC with Intranet access. After thorough consideration, they chose Sitrion ONE as their employee mobile app. Excited about the successful launch of compelling first results, they felt they were on to something great. So, they submitted their idea for the CEB Innovation Award last year. I was there as well, ready to receive the award and was very disappointed to hear that an Intranet was awarded for the Innovation Award. It was a great project with great achievements, but it was not clear that it fulfilled the goal of reaching and engaging not only the ‘intended’ audience, but all employees. Congratulations to the HealthSouth Hive team! What a great success for the Hive team. You did and are doing an amazing job. You have a clear vision of a successful employee app, and you made it a reality. On a daily basis, you are providing your employees with a ton of value, so that they take advantage of Hive again and again. This award is a great milestone in our partnership and I am looking forward to taking the next steps with you.